Cooooo! (Feat. Yamamura) is an Event Course in Super Mario Maker, released on January 12, 2016. It unlocks the Yamamura Mystery Mushroom costume upon completion. The level begins with a track and a Mystery Mushroom. It goes into a segment with many Big Piranha Plants as well as some Koopa Troopas carrying other enemies. 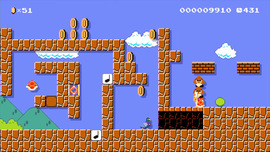 Mario must use the Koopa Troopas to continue across the level and reach a long segment with Hard Blocks on tracks, leading directly to the Goal Pole. This course was created by Yamamura of "Super Mario Maker: Crash Course" fame! He might look like a humble pigeon, but don't let that fool you—he's a master course creator! Here's what he had to say: "Coo! (To please my fans across the world, I had a special Yamamura costume made. I hope you all clear my course and get it!)" This page was last edited on November 15, 2018, at 16:48.